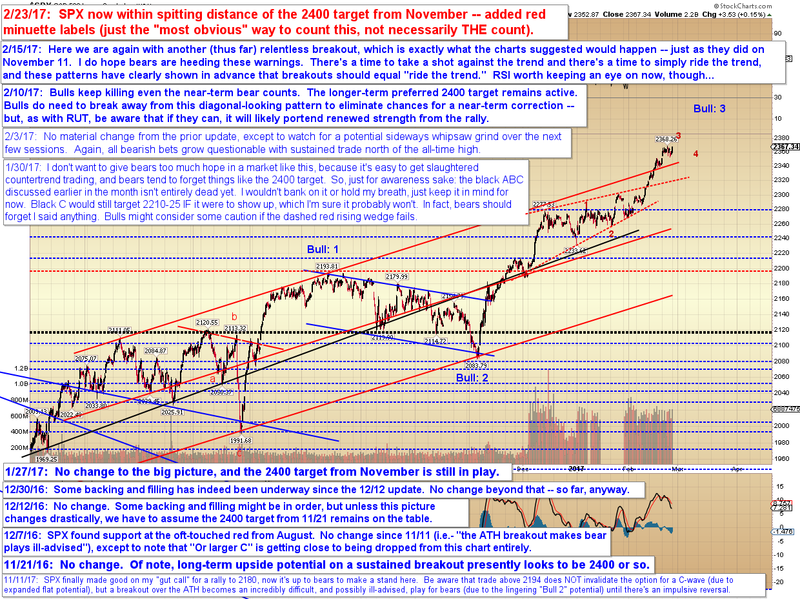 Pretzel Logic's Market Charts and Analysis: SPX Update: Market Pulls a Little "Gotcha!" 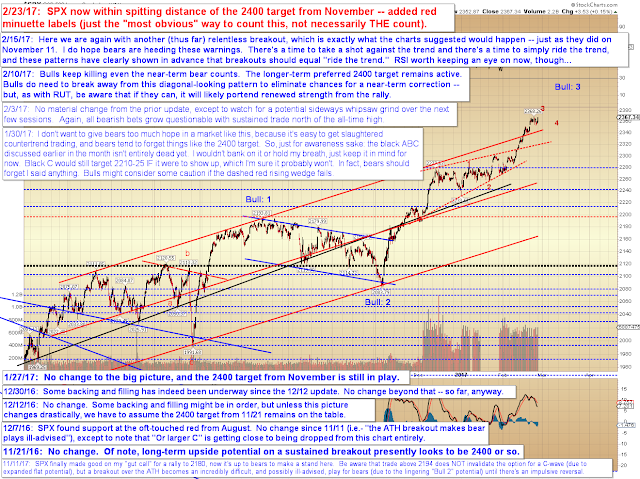 SPX Update: Market Pulls a Little "Gotcha!" The question is whether blue (4) is complete yet or not. If it is, then we're likely only about half-way through blue (5), so we would be looking at 2379-83 as the next target. 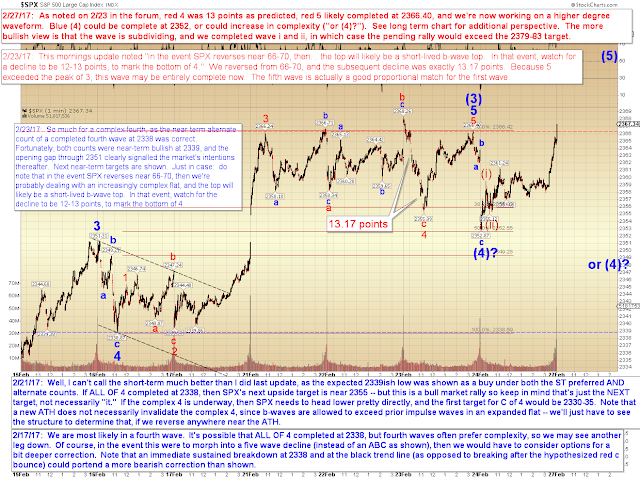 If the rally stalls here and reverses, then blue (4) may become more complex. 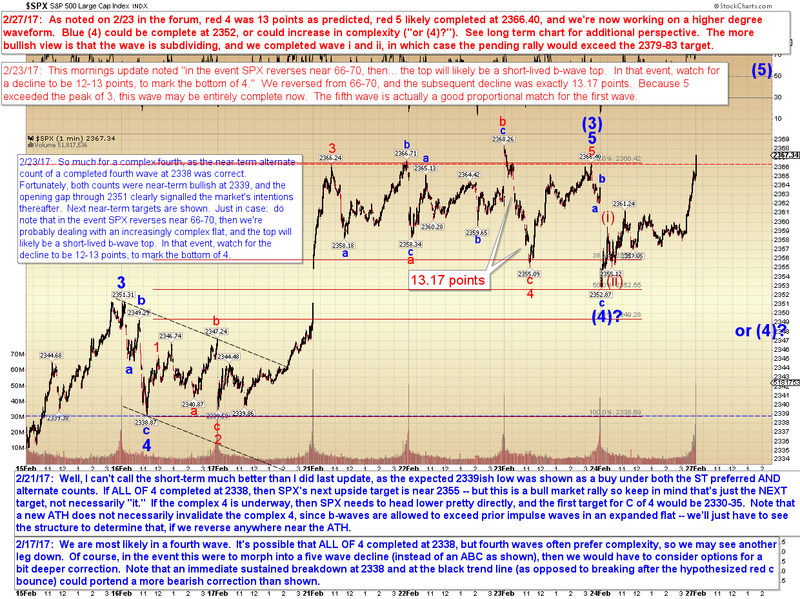 In the event 2353 fails, then we'd watch the 2343-48 zone for a potential (4) bottom. Do be aware that since this is a fourth wave at higher degree, it can run lower than that zone if it wants, and the invalidation levels for a fourth wave is way down near 2300. I've added a few more numbers to the long-term chart, just on the most recent subdivision of the current rally, mainly for perspective. Lately, waves have been acting a bit funny, so I'm not saying this is "fer sure THE count, man!" -- it's merely the most obvious way to count the waves currently, so it's more a "working" count for perspective purposes. In conclusion, we don't have any glaring wave patterns indicating a reversal yet, and the longer-term trend remains up. We could certainly see a more complex fourth wave unfold, however -- but that's not predictable at present, so we'll simply have to react in real-time if it occurs. Trade safe.